CLEVELAND—One way or another, the Browns were destined to make a statement to the rest of the sports world under the bright lights of Thursday Night Football. Either they would win and take a significant step toward becoming a relevant NFL franchise or lose and find themselves mired in all the misery of the same old Browns. 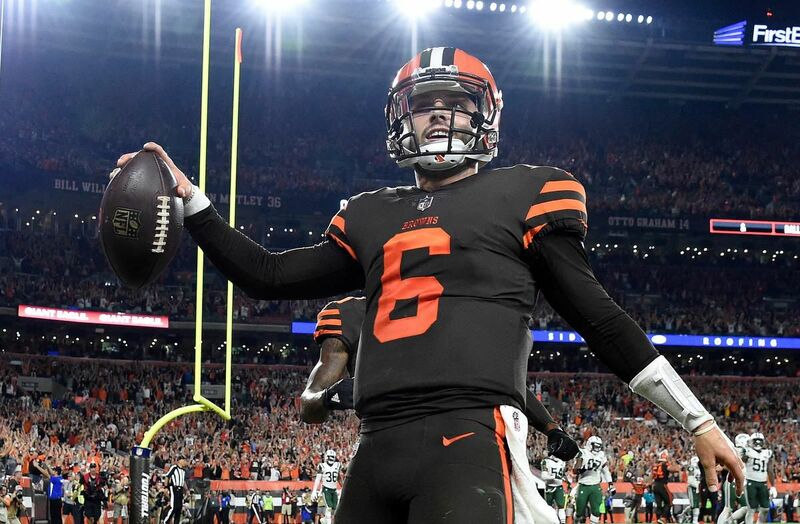 Fortunately for their tortured fan base, rookie quarterback Baker Mayfield came to the rescue and the Browns prevailed 21-17 in a nationally televised game against the New York Jets at FirstEnergy Stadium, halting a 19-game winless streak and tasting victory for the first time since Dec. 24, 2016. They showed general manager John Dorsey adding 33 players to the 53-man roster won’t go for naught and proved this year won’t be the same as the last two, when they went 1-31 under coach Hue Jackson. The drumbeat to fire Jackson will soften, for now, because the Browns faithful can finally talk about a win after watching their favourite team go 634 days without one. The Browns avoided the second-longest winless streak since the 1970 AFL-NFL merger. Boy, did they need this one, too, especially because they were three-point favourites against the Jets. They hadn’t been favoured since Sept. 24, 2017, when they lost 31-28 to the Indianapolis Colts at Lucas Oil Stadium. This time, with Mayfield leading the charge, the Browns (1-1-1) made enough plays to triumph. Mayfield’s regular-season NFL debut began when he entered the game with 1:42 remaining in the first half and the Browns trailing 14-0 after quarterback Tyrod Taylor suffered a concussion. Mayfield, the No. 1 overall pick in April’s draft, immediately gave the Browns a spark they desperately needed. He finished 17-of-23 passing for 201 yards with a rating of 100.1 and took one sack. There’s no turning back now. This is his team. The offence struggled mightily against the Jets (1-2) with Taylor operating the controls. He went 4-of-14 for 19 yards for a rating of 39.6, rushed four times for 22 yards and took three sacks. He got up slowly after the last one by linebacker Avery Williamson, disappeared into the medical tent on the sideline and never returned to the action. Mayfield, the reigning Heisman Trophy winner, went 3-of-4 passing for 47 yards during his first series to help the Browns move into position for new kicker Greg Joseph’s successful 45-yard field goal, which trimmed the Jets’ lead to 14-3 with 23 seconds left in the second quarter. The Jets took the same lead into halftime. The Browns cut their deficit to 14-6 with 5:21 left in the third quarter when Joseph made a 27-yard field goal after Mayfield’s pass into end zone was nearly intercepted but dropped by safety Doug Middleton. The score was set up by Browns rookie cornerback Denzel Ward forcing receiver Robby Anderson to fumble, recovering the ball and returning it 20 yards to the Jets eight-yard line with 6:19 left in the third quarter. During the Browns’ next possession, Mayfield threw a 29-yard dart to wide receiver Jarvis Landry, and running back Carlos Hyde rushed for a one-yard touchdown on the next play with 42 seconds remaining in the third quarter. Then the Browns executed a successful two-point conversion to tie the score at 14 when running back Duke Johnson took the snap, pitched the ball to Landry and Mayfield caught Landry’s pass in the end zone. Mayfield then got fired up on the sideline and motioned to the crowd as it roared. Led by rookie quarterback Sam Darnold, the third-overall selection whom the Browns decided to forgo in April’s draft by picking Mayfield instead at No. 1, the Jets answered with a 12-play, 65-yard march and took a 17-14 lead when Jason Myers made a 28-yard field goal with 8:56 left in the fourth quarter. Mayfield countered the scoring drive Darnold orchestrated with a clutch series. Hyde capped the 15-play, 75-yard march by rushing for a 1-yard touchdown with 2:04 left in the fourth quarter. The next series, Browns middle linebacker Joe Schobert intercepted Darnold’s pass intended for receiver Jermaine Kearse at the Jets 43 with 1:21 remaining. But the Browns punted to their opponent’s 6, giving the Jets one last chance. The Browns sealed the win when cornerback Terrance Mitchell intercepted a deep pass Darnold intended for Anderson with six seconds left. Darnold finished 15-of-31 passing for 169 yards with two interceptions for a rating of 38.3 and took two sacks.